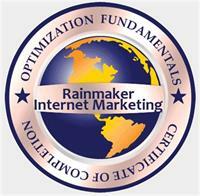 Rainmaker is made up of a talented passionate staff who truly care about what they do, and how well your company performs on the internet. Nowhere else will you receive such a high level of care and personal attention. Our business isn’t really so much a business, as it is a passion. We spend a great deal of time researching the latest trends, subscribing to the latest industry newsletters, and honing our skills, and it isn’t uncommon to find some of our staff members engrossed in an industry webinar at any given time of day. We’ve built this business through developing meaningful and lasting connections with each and every one of our clients. We’ll analyze any online marketing system you might already have in place, and actually show you how you can improve your results. In most cases, we actually identify substantial savings, while increasing campaign effectiveness. In between Paoletti's Cleaners and Hair Salon on the corner of Willow and Main Street.